*Apliqué is an overlay technique of soldering cut-out metal designs to a metal base. **Prices are indicative and depend on the current price of silver and on ring sizes. Shipping costs and US and Canadian tax rates excluded. See the order guide for shipping costs. ***Prices are indicative and depend on the ring sizes and the current price of silver and on exchange rates. Shipping costs excluded, Dutch BTW included. Please see Order guide for information on costs of delivery. In Anishinaabe tradition, the feathers of the Migizi, the Bald Eagle, are regarded as anam'ewin mizhinaweg, prayer carriers of messages and giving thanks. Migizi is known for soaring high in the sky and it is therefore understood that no other creature is closer to the Great Mystery than this mighty spirit bird. His feathers have the power to convey human thoughts and feelings directly to the Great Mystery; they provide him or her who seeks wisdom and curing with an opportunity to speak with debwewin (a straight mind) and bekide’ewin (a pure heart). 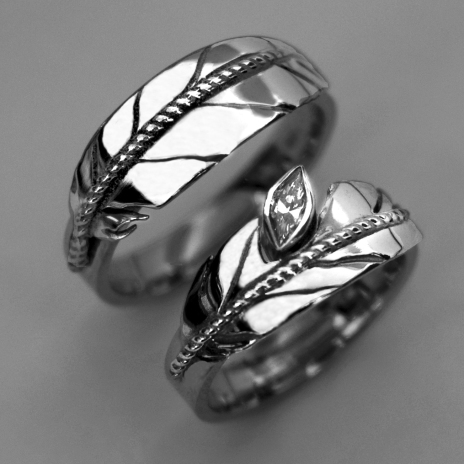 The stylized feathers adorning the above wedding rings symbolize spirit, honesty, and prayer; the sparkling fire of the Swarovski gemstone mounted on the ladies' ring represents the Teachings and the blessings of the Great Mystery that are being reflected back at the person who does the praying. The Great Mystery is generous with us." - A personal song to the Eagle by the jeweler. Why choose a Swarovski gemstone? Pure Brilliance Swarovski Zirconia is the most diamond-like Zirconia on the market – which makes it an excellent alternative to diamond for use in wedding rings. Swarovski Zirconia and diamond share a great number of similarities and are very difficult to distinguish from one another. The very high refractive index and perfect cut of Swarovski Zirconia imitate the brilliance and fire of the purest diamonds. Swarovski Zirconia is very hard, heat resistant, and refracts light just like a diamond. These characteristics make it the most popular diamond imitation. Diamonds are naturally occurring gemstones; Swarovski Zirconia, however, is a laboratory-created material. Diamonds are the hardest minerals that exist with a hardness of 10 on the Mohs scale. Swarovski Zirconia is still very hard, reaching a rating of 8.5. Since Swarovski is eco-friendly because of its less exploitative mining practices necessary to obtain it, it makes it a popular alternative to diamonds. Last but not least, Swarovski gemstones cost less than moissanites and only a fraction of the price of a comparable diamond. This makes a wedding ring set with a Swarovski gemstone quite affordable. Why choose a moissanite gemstone? Moissanite is a rare gem, a precious gift from our Mother the Earth, discovered in a meteorite crater located in Canyon Diablo, Arizona, in 1893. It is durable and tough (as it is extremely resistant to scratching, abrasion, breaking, or chipping), and more brilliant (has more rainbow colors) than diamond. Also, it doesn’t have the natural inclusions and cloudiness that diamond has. Thanks to a dispersion that’s 2.4 times higher than diamond, moissanite bends light into mesmerizing rainbow flashes of fire - more than twice as much as diamond. Moissanite is extremely resistant to scratching and abrasion. Diamond is the hardest gemstone used in jewelry but moissanite, with a hardness of 9.25, is harder than all other gemstones including ruby and sapphire. The Moissanite stones that we use in our wedding rings, recreated in a lab through a patented thermal growing process, are all high-quality gems precisely hand-cut by a master gem cutter from Charles & Colvard. The technology used creates maximum brilliance, intensifying an ultimate fire, and guaranteeing an unmatched brilliance and fire for life. A moissanite gemstone, eco-friendly because of its less exploitative mining practices necessary to obtain it, makes it a popular alternative to diamonds. Last but not least, moissanite costs a fraction of the price of a comparable diamond, which makes our wedding rings much more affordable.